In a medium bowl, mix the first four ingredients until well combined. Form 1 tablespoon of the potato mixture into a ball then flatten into a ½ inch patty. Press the flattened ball into the breadcrumbs or wheat germ or crushed soda crackers. Then repeat on the other side. Place on a cookie sheet. Repeat for the remaining croquettes. If possible, store in the fridge for 30 minutes to harden the croquettes. Heat 1 tablespoon of oil in a large frying pan. 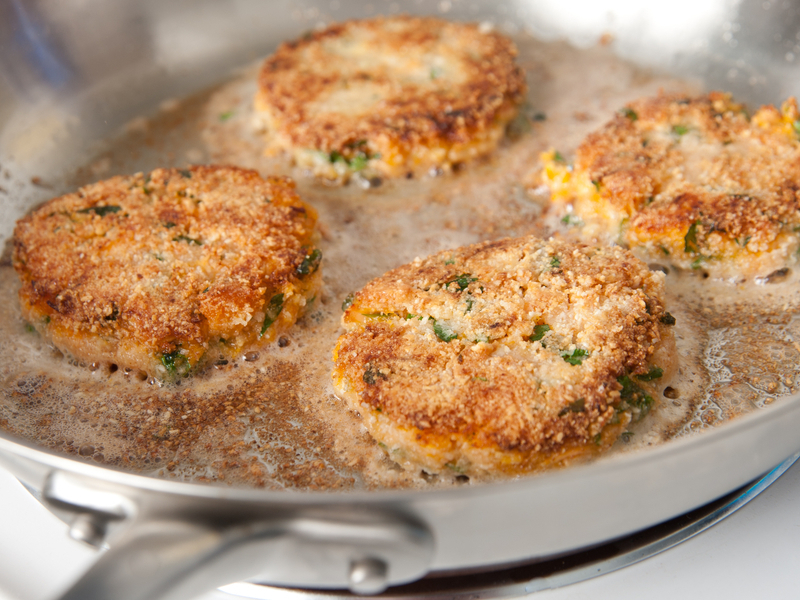 Place croquettes in the sizzling oil. Flip when golden brown. Repeat for the remaining croquettes. Canned salmon is rich in protein, vitamin D, calcium (from the bones) and healthy omega-3 fats. Omega-3 fats are heart-healthy fats and promote healthy brain development in babies.